CHICAGO, Illinois, November 18, 2013 (ENS) – Tornadoes claimed the lives of at least eight people across the Midwest Sunday – two in Michigan and six in Illinois according to officials in those states. Severe weather was felt across Illinois, Indiana, Michigan, Ohio, and Wisconsin as numerous fast-moving thunderstorms, producing strong tornadoes with widespread damaging winds and large hail, moved across the middle Mississippi and Ohio Valley region and the southern Great Lakes. 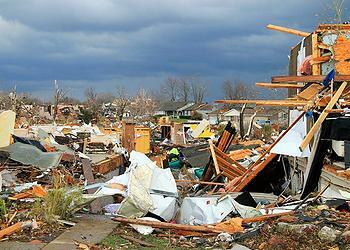 Illinois Governor Pat Quinn today declared seven counties to be state disaster areas after severe storms generating tornadoes and high winds ripped across Illinois on Sunday. At least six people are reported dead and dozens more injured across the seven counties: Champaign, Grundy, LaSalle, Massac, Tazewell, Washington and Woodford counties. Hundreds of homes and businesses have been damaged or destroyed, hundreds of thousands of people are without power, and numerous roads throughout the state have been closed by fallen trees and downed power lines. Today, Governor Quinn inspected damage in some of Illinois’ hardest hit communities: Washington, Diamond, Gifford, Brookport and New Minden. The state disaster declaration frees up trucks, heavy equipment to remove debris, communications equipment and assistance with security and other public safety issues to help affected communities respond and recover from the storms. The state has dispatched technical rescue teams to impacted locations across the state, and provided emergency generators, light towers and communications systems. In Ohio, nearly 100,000 customers lost power. Areas reporting damage include Putnam and Wood counties. “We applaud the efforts of people who paid attention to the severe weather warnings, watched their local news and took actions when encouraged to do so,” said Nancy Dragani, Ohio state Emergency Operations Center director. KNOXVILLE, Tennessee, November 18, 2013 (ENS) – The Tennessee Valley Authority Board of Directors has voted to retire units at three of its coal-fired power plants. The TVA Board of Directors approved a coal fleet plan that will retire eight coal units at three plant sites with more than 3,000 megawatts of combined generating capacity. A number of these units were already idled or scheduled for idling and/or retirement based on an agreement with the U.S. Environmental Protection Agency. “This will support our focus on cleaner energy and bring additional, necessary balance into our portfolio for managing our current and projected load profile,” Johnson told the board. “Over the past months, we considered a number of capacity studies, including TVA’s 2011 Integrated Resource Plan and associated financial and environmental analyses. We also looked hard at the effect on rates, our employees and any potential economic impact to local communities,” he said. The retirements affect all five coal units at the Colbert Fossil Plant in Tuscumbia, Alabama; one of two operating coal units at Widows Creek Fossil Plant in Stevenson, Alabama, and two of three coal units at the Paradise Fossil Plant near Central City, Kentucky. Paradise Unit 3, one of TVA’s largest coal units, will continue to operate. A corporation owned by the U.S. government, TVA provides electricity for nine million people in parts of seven southeastern states at prices below the national average. TVA receives no taxpayer money and makes no profits. “TVA’s commitment to retire units at three coal plants will protect customers from rising energy bills as coal prices increase, and protect families from the health threats posed by coal pollution,” said Owen. According to the Clean Air Task Force, pollution from the Colbert coal plant in Alabama alone has contributed to 940 asthma attacks, 83 heart attacks, and 57 deaths per year. As it transitions away from coal, TVA should bypass natural gas or any other fossil fuel say representatives of the groups concerned about TVA environmental and public health issues. “We applaud the direction of TVA and are looking forward to improved air quality and the many other benefits that will be realized for the Southeastern national parks and Great Smoky Mountains,” said Don Barger, senior regional director, Southeast Regional Office, National Parks Conservation Association. SALT LAKE CITY, Utah, November 18, 2013 (ENS) – The U.S. Bureau of Land Management has deferred its plan to sell oil and gas leases on 80,000 acres of wilderness-caliber lands in the San Rafael Swell. Located in south-central Utah, about 30 miles west of Green River, Utah, the San Rafael Swell is a giant dome-shaped formation of sandstone, shale, and limestone that was pushed up 60-40 million years ago. 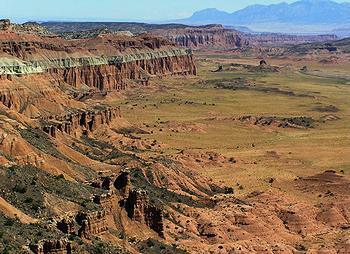 Flash floods have since eroded the sedimentary rocks into many valleys, canyons, gorges, mesas and buttes. Ancient petroglyphs are found throughout the area. The region has been proposed for protection as a national park, national monument, national conservation area, and wilderness. SUWA, with other conservation groups, filed a protest of the lease sale. The Alliance thanked those who flooded the BLM with more than 5,000 comments opposing the proposed lease sale and the 200 Utahans who rallied with signs and banners outside the BLM’s Salt Lake City office. “Because of you, the San Rafael Swell has been spared the onslaught of drill rigs, pipelines, road scars, gas flares, air pollution, and the thumping of pumpers,” said Terri Martin, Western Regional Organizer of SUWA, which celebrated its 30th birthday on Saturday. Conservationists argued that the Swell, with its majestic mesas, jagged cliff faces, twisting spires and hoodoos in south central Utah, is too precious to drill. They said the lease sale was unnecessary because more than three million acres of BLM lands in Utah are already under lease but have not been developed. WASHINGTON, DC, November 18, 2013 (ENS) – Higher temperatures, worse droughts and more extreme weather events fueled by human-caused climate change are making survival more difficult for America’s wild large mammals from coast to coast, finds a new report from the National Wildlife Federation, NWF. “With less snowpack to kill ticks, moose in New Hampshire are literally being eaten alive, losing so much blood to ticks that they die of anemia,” the report warns. The NWF report covers the effects of climate change on moose, mule deer, white-tailed deer, elk, pronghorn, bighorn sheep and black bears, characterized as “big game” by the organization because they attract hunters. The report, “Nowhere to Run: Big Game Wildlife in a Warming World,” warns that climate change is already putting many species of big game and the outdoor economy that depends on them at risk. Read the report at NWF.org/Sportsmen. In 2011, there were more than 12 million adult big game hunters who spent more than $16 billion on hunting. Climate change is causing heat stress, parasites and disease, and alteration of ecosystems on which wildlife depend. Moose across the country become heat-stressed if temperatures climb above 70 degrees, resulting in declining pregnancy rates and increased vulnerability to predators and disease. Warmer fall and winter temperatures have kept black bears more active than usual during their normal hibernation period, pushing fat stores to the limit. Droughts have reduced aspen forests in the west, a favorite elk habitat and are altering sagebrush and grassland ecosystems, favored pronghorn habitats. And white-tailed deer are susceptible to hemorrhagic disease caused by viruses transmitted by biting midges. The group advocates transition to offshore wind, solar power and next-generation biofuels and avoidance of polluting energy like coal and tar sands. oil. The National Wildlife Federation is also running radio ads educating sportsmen about climate change’s threat to moose in Maine, Michigan, Minnesota, Montana and New Hampshire. LIHUE, Kauai, Hawaii, November 18, 2013 (ENS) – The Kauai County Council Saturday voted 5-2 to override Mayor Bernard Carvalho’s veto of a bill that would require users of large amounts of restricted use pesticides to disclose the chemicals they spray. Most of these pesticide users on Kauai are producers of genetically engineered crops. The measure also puts in place pesticide buffer zones around sensitive areas like waterways, nursing homes, residences and parks, and requires disclosure of where genetically modified crops are being grown. The bill is now law, and will take effect in nine months. The law requires companies that use more than five pounds or 15 gallons of restricted-use pesticides annually to reveal the chemicals they use. But the mayor said he disagreed with the legal path to this goal presented by Bill 2491. “I truly believe that we could have accomplshed these goals faster and in a legally sound manner by working cooperatively with the state, whichhas clear legal authority over buffer zones and pesticide disclosure,” Carvalho wrote. But nonprofit public interest lawyers with Earthjustice disagree and maintain that Kauai County does, in fact, have the legal authority to require disclosure and buffer zones.